(Regarding the history of this photograph, please Click Here to read my blog Fire-Fire-Fire/). Mangalsutra is considered as the symbol of marriage in India. The word Mangalsutra is derived from sankrit word ‘Mangal’ which meaning holy and ‘Sutra’ meaning thread. The tradition of tying Mangalsutra is followed among almost all the Indian communities. 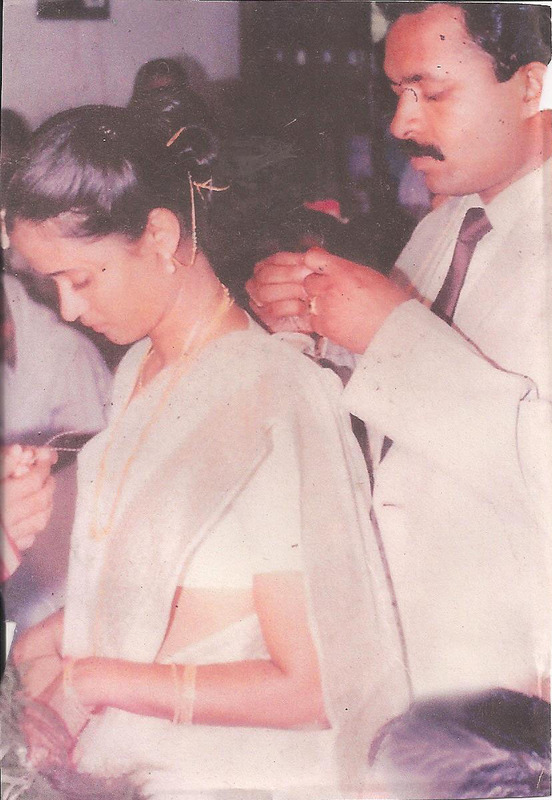 It is a chain or a thread with a pendant tied by the groom around the bride’s neck on the marriage day. There are a wide variety of Mangalsutra used by various communities, castes and sub castes. Nowadays there are trendy Mangalsutras in the market with expensive stones like diamonds and ruby. The days of a Digital Mangalsutra too appears imminent. ‘Pennu Kettu’ is the colloquial Malayalam equivalent of wedding, which literally means tying of the bride. The Mangalsutras used in Kerala, the Hindus use ‘Thaali’ and the Christians ‘Minnu’. The Muslims in North Kerala (Malabar), traditionally do not have a Thaali. However, nowadays, on the wedding day, the groom does put a gold chain around the bride’s neck, which some brides preserve like the Thaali. The Muslims brides from South Kerala (Travancore) do wear the Thaali. In the Nair community, women had a special status as they followed a matriarchal system of inheritance of wealth and property. Many Nair families follow this tradition even today though some have moved on to some form of patriarchal system. The Nair males had no role in succession and had no control over the property and were mere managers of the property. Until 1930s, a Nair lady could enter into cohabitation (live-in relationship) with men of higher castes or even among Nairs and this co-habitation was called as Sambandam. The male gave a white mundu (dhothi) to the lady. The acceptance of mundu was considered as permission to enter into the lady’s bedroom. This mundu given at the Sambandam came to be known as the Manthrakodi – Manthra meaning blessed and Kodi meaning new. When a lady wanted to terminate a relationship with the man, the mundu could be returned or a thread could be taken out of mundu and broken into two pieces, symbolising end of relationship. The mother held absolute right over the children and the children never took the name or lineage of their father. Today the practise of Sambandam has been replaced by the institutionalised marriage. Like the Nairs, all other Hindus of Kerala solemnise their wedding by the groom giving the Manthrakodi to the bride. The Thaali is sometimes referred to as Ela-Thaali translated as Leaf-Thaali, because of its peculiar shape like a banyan leaf. It is said that the shape of the Thaali resembles a banyan leaf because a banyan tree itself is a symbol for support, shelter, and care. Malabar Marriage Act of 1896 was the first legislation to legitimise Sambandham among Nairs. The act did not achieve the desired results. It was followed by Travancore Nair Act of 1912, 1925 and the Cochin Nair Act of 1920 which made Sambandham illegal and broke the matriarchal system of inheritance among Nairs. Mannath Padmanabhan, a social reformist, exhorted Nair males to find jobs, earn income and take responsibility of their wives and children. EMS Namboothiripad, the first elected Communist Chief Minister of India, exhorted all men to take up the role of producer and provider for their families. Most Namboothiris – the Brahmins of Kerala – have a patriarchal family system, barring a few with matriarchal system. The marriage ceremony is called ‘Veli’ and is a four day affair. The speciality is that the Thali Kettu (tying of the Thaali) is done by the bride’s father. Out of the eight different marriage styles for Indian Brahmans, the only style which needs the bride’s father to do Thaali Kettu was opted by Namboothiris and is called Kantthasoothram. The common practice among Indian Brahmans is that the groom does the Thaali Kettu and is called Mangalyasoothram. Namboothiris consider Kantthasoothram better as it enables their ladies to perform Bali and Sraadham (rituals conducted post-funeral to enable the spirits to reach heaven) of her parents. The Thaali Kettu, originally a Namboothiri ritual, was later on adopted by most Hindus, Christians and Muslims. The Christians called it the ‘Minnu’. The Minnu is a pendant with a cross, the symbol of Christianity, on a gold medallion shaped like a heart. The heart symbolises the concept of love, and the cross reflects that the relationship between a husband and wife must follow the relationship between Jesus and his bride, the Church. The Minnu is put on seven strands of thread from the Manthrakodi. Seven represents the bride, the groom, the couple’s parents and the Church. The brother-in-law of the groom prepares the thread the evening before the wedding. The knot to be tied is the Aan-Kettu, meaning the male knot, which in fact is the reef knot. The brother-in-law being experienced with his wedding, acts as a coach to the groom and would make the groom practise the knot until achieving perfection. Many grooms tremble while tying the knot as all the eyes and cameras in the church are trained on to the knot being tied. Placing the Manthrakodi upon the bride’s head symbolises the groom accepting the responsibility to protect and cherish his bride. This is a tradition adapted from the Nairs. A woman from the groom’s family, usually the sister or a cousin of the groom, stands behind the bride once the Thaali is tied, signifying the reception into the household of her husband. In some Christian communities, the Minnu remains on the thread for one week until the groom’s mother cuts the thread, and the Minnu is moved onto a chain. The Muslim wedding in Kerala is an amalgamation of Kerala Nair and Islamic traditions. In India, Islam first came to Kerala due to the spice trade with the Arabs who took the spices of Kerala to Europe. It is believed that the first mosque of India, the Cheraman Juma Masjid, was built in 629 (during the life of Prophet Muhammad) in Kerala. Traditionally, Oppana, a folk dance form specific to the Muslim community of North Kerala, is performed the day before the wedding day. The dance is generally presented by young female relatives of the bride, who sing and dance around the bride clapping their hands. The aim is to entertain the bride who sits in the centre, dressed in all finery, covered with gold ornaments. Today, Oppana in some form or the other is practised amongst Muslims all over Kerala. On the wedding day the Nikkah ceremony is conducted – the official marriage contract – either at the mosque or at the bride’s home. The Nikkah ceremony is mostly all male affair. After the Nikkah ceremony, the Muslims is Southern Kerala have a ceremony for tying the Thaali in the presence of all the relatives and friends. Marathi Mangalsutra is a combination of black and gold beads in a double layer which symbolises Shiva and Shakti along with a pendant. The black beads chain with diamond pendant is usually used by the Marwaris, Gujaratis etc but it is becoming a widely used trend. In Telugu communities the Mangalsutra contains coral beads, gold coins etc along with the main pendant and gold chain. In Tamil Brahmans the Thali or Thirumangalyam is a pendent which is worn on a thread dipped in turmeric water. The Kashmiri Brahmins have a very different way of wearing Mangalsutra, which goes through the ears. The tradition of tying Mangalsutra is the symbol of holy matrimony in India. In today’s India people prefer less jewellery and because of this trend people wear Mangalsutra only to family functions, weddings etc. India is famous for its rich and varied traditions and all Indians must be proud of such traditions. It is the duty of the generations to come to preserve such unique customs and traditions. A well researched article, Reji. Enthralling as usual. You must compile all these into a book. Pingback: Mangalsutra Designs in Different Indian Cultures – Sampat Jewellers Inc. In fact I was in search of these details, thanks.